Back To Basics ! How A Steam Locomotive Works! Very simply put, the steam locomotive is marvelous invention using basic physics to move tons of steel! No transmission needed. All direct drive using the H2O turned in to steam with a valves, pistons and driving rods……and that’s it. Although various types of valves have been used throughout the years, the principal remains basically the same. In a reciprocating steam engine, the slide valve moves back and forth over the piston by admitting steam to the front end of the cylinder and then to rear in a continuous motion. At the end of the piston stroke, the valves shifts and opens to allow the remaining steam (spent steam) to escape. This is the “choo, choo” sound you hear when the train starts to move at the station. Maximum steam pressure being released after each stroke of the piston. The steam escapes out of the top of the smoke stack along with gases and smoke from the boiler. Excess steam is also allowed to escape from the cylinder overflow valves as well. The Walschaerts valve gear was invented to control the amount of steam being let into the pistons of the steam locomotive. The Walschaerts valve allowed the engineer to apply maximum steam when starting the locomotive from a standstill at a station and then dial back the amount of steam needed when the train reached desired speed. The cylinders are designed to handle tremendous amounts of steam pressure generated by the boiler. 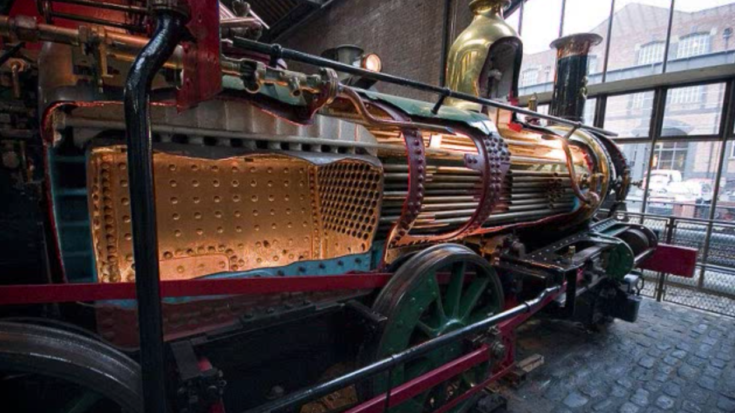 Let us know if you have ever seen a cut away of a steam engine in a museum. We would love to hear thoughts!